This is one of our most popular cross-country skiing holidays with Headwater guests returning year after year. It is based in central Norway, on the edge of the Rondane National Park, looking down on the Gudbrandsdalen Valley, just north of Lillehammer. The landscape is dramatic and full of contrasts from spectacular gorges and snow-capped peaks to pretty fells and valleys that extend as far as the eye can see. It's far enough north to have a good chance of seeing the Northern Lights too, especially in December and January, and throughout the winter there are spectacular sunrises and sunsets. It has always been traditional to travel on skis here, so it's perfect for cross-country skiing, and the guides at Venabu will help you get started. All weeks are suitable for beginners to intermediates. If you are an experienced cross-country skier the hotel offers ski safaris (payable locally) from 23 February to 23 March, for longer excursions including off-track skiing. You can also try dog sledding, snowshoeing or go on a torch-lit, horse-drawn sleigh ride (payable locally). During the week you might like to take the train to Lillehammer, where there are several fascinating museums of Norwegian history, Olympic history and Norwegian culture, plus several art galleries. You can also try tobogganing here too. Different snow activities and games are provided for children during February half term and Easter week, including ice fishing. The Venabu Fjellhotel has been run by the Tvete family for over 50 years. Birgit and Arvid Tvete built the hotel from scratch, choosing the original plot because of its tremendous views. It has developed into a friendly, relaxing 'home from home' in a fabulous setting. The dining room - which offers a spectacular Scandinavian buffet - affords glorious panoramic views out across the mountains. The food is all traditional Norwegian cuisine. Breakfast is a continental buffet with the highlight being the selection of tasty local cheeses. You can have the choice of a buffet lunch with a hot meal or a picnic lunch to have whilst you take in the spectacular scenery. Dinner will either consist of an extensive hot and cold buffet or a set dinner. On Wednesday there is a special Norwegian buffet. For New Year's Eve champagne and a special four-course meal with cheese and dessert buffet will be served. Read more about this holiday in Catherine's Cultural Wednesday. We meet you at Oslo Airport for the transfer to Venabu (3hrs) in time for dinner. The resident ski guides cater for different ability levels and you can even switch between groups mid-week. The first two days are usually to help learn the principles of gliding on snow. Two or three optional tours are offered for confident beginners or intermediates. You can also mix it up by skiing independently, trying one of the other winter activities - such as snow shoeing - available here (payable locally) or joining the ski safaris (50% off-track) for advanced skiers, which are offered on departures from 23 February to 23 March inclusive (ski safari is payable locally). We take you to Oslo Airport for your flight home. This traditional hotel is in a magnificent isolated location on the plateau above Ringebu. You can choose to stay in either the east wing (20 standard rooms) or the west wing (36 superior rooms) and everyone can use the hotel's saunas and ski waxing centre. All rooms in the hotel are en-suite and are mostly twin with the traditional single beds which are end to end. There are no tea/coffee making facilities in the rooms, however, both tea and coffee are available from reception all day. Wi-Fi is available for free in the hotel although signal is best in the comfortable bar area with fireplace. Within the main building you have, ski lab, boot room, sauna, games room, TV room, traditional hand-made product shop, a large lounge area with a bar for relaxing after dinner, and two spacious sitting rooms with open fireplaces. Room upgrades: West Wing Single Room, West Wing Twin / Double room or West Wing Corner . West Wing rooms are more spacious than the East Wing ones. The West Wing Twin rooms have got Scandinavian beds (single beds with end to end). West Wing Single rooms are effectively West Wing Twin rooms so double for sole occupancy with 2 beds (single beds with end to end). The single supplement is included in the room upgrade supplement for the applicable weeks. West Wing Corner rooms have got double beds and are also suitable for families. The Hotel Cecil is a modern 3 star hotel situated next to the parliament and is in an ideal location for exploring the city centre. All rooms are light and airy with full en-suite facilities. They also come equipped with direct dial telephone, cable television and air-conditioning. Breakfast is buffet style and there is a selection of restaurants within walking distance for your evening meal. Transfers included from Oslo Gardermoen airport at 13:30 (16/02 13:55), and back to Oslo Gardermoen airport at 09.15. Beautiful location, plenty of ski trails for all levels, comfortable family run hotel with fabulous food and helpful knowledgeable ski guides. Nothing is too much trouble and every effort is made to ensure your comfort and enjoyment of the trip. Excellent skiing area and accommodation, fantastic buffet food. The hotel provides its own guides who take you out on guided tours. The guiding was very good but there was no particular tuition for improvement. The emphasis is on off piste so you are given mountain skis with metal edges and boots which are heavier but really come into their own when you do go off piste and are excellent there. This was one of the best cross country skiing holidays I have ever had. Hotel and terrain excellent, guides superb, everything worked wonderfully. Thank you so much. 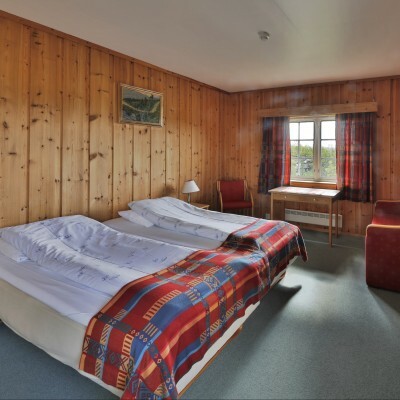 The hotel / skiing centre is very well managed, with helpful staff and a comfortable and relaxed atmosphere. The support for skiing and other activities is excellent and uses encouraging and well-qualified guides. It caters well for both absolute beginners and experienced skiers. Excellent holiday. The international team of guides and ski teachers are experts and keen to share their knowledge of cross country skiing that add value to the holiday experience. They were relaxed and professional in their approach and were outstanding. The hotel accommodation is very comfortable and there is a relaxed atmosphere. The food served in the restaurant was delicious. Every meal time (breakfast, lunch, dinner) exceeded expectations. A variety of delicious dishes were serviced to satisfy all tastes - the hard bit was making a choice. Awesome! Great holiday, we travelled as a group of 4 with different skiing abilities so the mix of guided tours and ski safaris suited us. The guides were excellent and the hotel food stunning. The hotel, location, accommodation and great choice of buffet food makes this an excellent place to come for cross country skiing. It was my first time here and new to cross country skiing. Though I enjoyed the skiing it didn't grab me as it did to many of the clients who have returned many times. There isn't much else to do if cross country skiing is not for you so bring books to read and a tablet so you could watch movies. The extra activities such as snow shoeing and sleigh ride could cost a lot less. Ski guides/instructors at Venabu Fjellhotel are kind, experienced and inspiring. They can adapt to the individual’s needs while still catering for the group as a whole. The hotel staff are helpful and accepting. The number of repeat visitors is testimony to the stellar quality of this trip. A truly wonderful holiday in a beautiful setting with friendly and helpful staff and instructors. A great adventure in Norway. A great holiday. A very comfortable and welcoming hotel, with excellent buffet meals. The skiing was well organised and accessible to complete beginners like us. We were out skiing on the trails within a couple of hours. A good variety of other activities from dog sledding and snow shoeing, to an art tour of the hotel. I can understand why people return to Venabu year after year. It is a beautiful and peaceful place. Great skiing from a lovely hotel with excellent food. A great weeks skiing in beautiful surroundings with great guides. The hotel is traditionally Norwegian and the food is fresh , wholesome and delicious. A great ski holiday. This was an amazing last minute holiday. I am a single lady and was slightly apprehensive at going abroad on my own. The Headwater team assured me other single travellers were on this trip so no need to worry. The Headwater team were honest with their feedback (they had visit Venabu Fjellhotel). The staff were great, the ski instructors very patient with the newbies. There were many returning people to this hotel on my visit. The tracks and trails from this hotel door are amazing, keep a look out for the trolls in the forests!! Take the snow shoeing tour to the frozen waterfall and do the night time ski experience. An amazing week, lots of clean fresh air, many calories burned but needed to due to the amazing cakes on offer every lunch and dinner. I can highly recommend this trip.. This was one of the best trips I've ever taken! The hotel was perfect, the food was great (which was good since I was so hungry after skiing most of every day), the guides and group ski tours were perfectly suited to the ski level of the group. I can't think of a single thing that could have been better. An very enjoyable skiing experience which is different from the Alpine resorts with amazing food and personal attention. Beautiful location, very friendly and relaxed staff on site, amazing food, excellent ski instructors/guides. A fantastic trip, stunning scenery, great hosts and wonderful food. We are so pleased to read that you had an excellent holiday.Thank you for taking the in sharing your experience and hopefully we will be able to welcome you back to another fantastic Headwater holiday in the future. A glorious setting, great skiing, wonderful hosts and fantastic food. Wonderful location and lovely family run hotel. Great guides to take you out everyday to explore the vast area which is truly stunning and so quiet. A great cross country skiing experience. Lovely hotel, beautiful location, great food and well organised ski guiding. Great experience. Instructors friendly and helpful. Attentive to individual needs. Food plentiful and nutritious. Graduated activity levels adjusted to day to day conditions. Hotel friendly and relaxed, and popular with Norwegians as well as international guests. Nordic skiing is really hard work, but it was very well worth the effort. The hotel was clean & comfortable, the food excellent & plentiful & the staff friendly & helpful. The situation was spectacular & the guides very knowledgeable. A holiday experience well worth the effort. The hotel at Venabu is an absolute delight. Family owned and managed, it combines Norwegian rustic charm (think life size trolls relaxing on a sleigh in the reception) and homely comfort (log fires, pepperkaka, sheepskin throws over armchairs and sofas) with really top level cuisine. Every meal was delicious and plentiful: we thought the buffet style worked really well as there were so many tempting side dishes to sample. The skiing was brilliantly organised and taught, with expert and friendly teachers, amongst whom Robert was a particular star. Sure, our bedroom was small...but the shower was spotlessly clean and the bed was very comfortable. We have no complaints, just praise and thanks to all at Venabu Fjallhotel. A warm friendly hotel in an area which provides skiing for all ability levels . Venabu is the ideal location for cross country skiing. Robert and the other ski instructors are excellent. They have an in depth knowledge of cross country skiing which they readily share. There is a good mixture of skiing on the loipa and in the forests and across frozen lakes. The night sky is memorable including lying on your back looking at a fantastic starry ski with a hint of the quot;Heavenly dancers & quot;. You normally have a choice of skiing at three different grades. The hotel is comfortable with really considerate staff. The food is fantastic especially the porridge. If you enjoy cross country skiing go. We are so pleased to read that you have enjoyed your holiday. Thank you for sharing your experience in Venabu and I do hope that we are able to welcome you to another Headwater holiday in the future. This is an excellent venue for x-country skiing - this is now our third visit in a row to Venabu. You cannot fault the skill and enthusiasm of the team of ski guides and the friendliness and helpfulness of all the hotel staff. We are so happy to read that you had an excellent holiday to Venabu. Thank you for your kind comments regarding the Ski guides and the friendliness of the hotel staff. Thank you for your feedback regarding your holiday. We are delighted that you had a great time. The holiday package did change this winter, in that snowshoeing is now payable locally as opposed to being included, as in previous years. All of our documentation and website has been amended to show this, however we do appreciate this can be overlooked and I do understand the change was a disappointment to you and for this we apologise. I do hope you’ll enjoy more holidays in Venabu for many years to come and thanks again for sharing your holiday experience. Excellent week in this traditional Norwegian hotel with the usual experienced and friendly ski guides. An excellent introduction to cross-country skiing in a beautiful location. it was one of the best holidays I remember. I cannot wait to go back. A good location to try cross country skiing for the first time in a beautiful location. The perfect place to go for cross-country skiing! Incredibly beautiful landscape with lots of very nice trails and off-track opportunities. The hotel is very well located. There are trails going off to every direction! Food is excellent and the staff is friendly and very helpful. Location is ideal - a large, hilly plateau with 150 km of trails, most with tracks regularly refreshed. With Rondane National Park on the edge of the area, it gives great views and a chance to go visit. The hotel is not alone, there were a few discreet chalets around with access roads but we were there over Easter, "the busiest weekend", and it was quiet. Instruction and guiding is good. Dedicated and experienced, the guides take you on great circuits. The safaris had finished for the season but the 4 hour trips each morning were ample to satisfy our exercise drive. The afternoons are available to go out on your own and navigation is dead easy. Sometimes you need to ask the guides for tips on technique if you want to improve, that could be more forthcoming. The ski waxing rituals were explained on the first morning but there could have been more checking that you did it properly on subsequent days. It's a real pain when you start sliding back when you are most tired. Accommodation is superb. It's an old hotel that has been well maintained, we had an older room that was basic but good - a fantastic view, a great shower and a good double bed, they have only a few, ask for it. 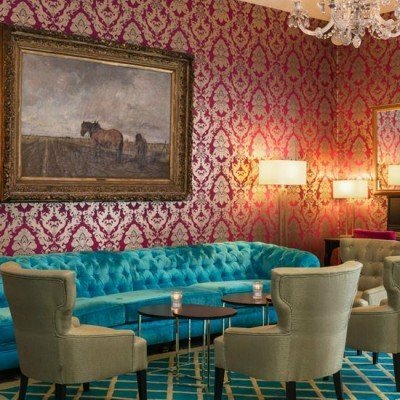 There's a big communal lounge for relaxing at any time, with a piano player too. The food was excellent, 3 hot buffet meals a day with 3 courses, or as many as you like, difficult to resist. They stage a Norwegian night with preserved meat and fish that was fantastic, some brand new flavours. There are are add-ons:- massages (excellent); pilates (not too hard); yoga (not great) and a felting workshop which was poorly taught with nothing in English. People come back here again and again, with good reason. This was the first time I had travelled on my own which I was anxious about, but any worries were dismissed on arrival at the hotel - with all 9 Headwater guests sharing the same dinner table. We could all 'dip in and dip out' of eating together - very flexible. The food was superb - and dare I say it too much!!!! The ski guides were excellent, and timings of routes accurate, - it was also lovely to have the flexibility of switching between longer and shorter trips during the week. It was a positive experience and one which I will definitely repeat, thank you so much. Excellent food and well led skiing. Wonderful location for a peaceful holiday. Too many people so no individual attention , therefore after day2 we skied on our own instead of joining a group ski - noone noticed ! Food was delicious and plentiful but it was luck of the draw where you could find a seat every mealtime. Well worth it! Fantastic location for cross country skiing, wonderful food, comfortable accommodation. Be prepared for quiet evenings. Excellent guiding, northern lights if you’re lucky! Excellent hotel in a superb location. The trails were well marked and extremely well maintained. The skiing conditions were as good as you'll find anywhere. Extremely pleased with the holiday and we will be coming back. Venabu is a great location for both novice and experienced nordic skiers. The staff, facilities and food are all excellent and help you make the most out of your holiday. I have no hesitation in recommending a Nordic Ski holiday in Venabu to anyone who wants to try this wonderful sport. Excellent trip, great skiing with excellent conditions. The hotel is superbly located - excellent ski trails, good equipment and good guides. The food is very good too. this was our second trip, which was as good as last year's trip - and I have no doubt we'll be there again next year. Excellent location for cross country skiing. Bedrooms basic and could do with updating but the hotel was otherwise excellent. The ski guides were superb. Brilliant cross country skiing in a fantastic location. Venabu is the perfect location for cross country skiing. The snow quality is predictably excellent. The plateau is surrounded by low mountains and offers easy gentle track skiing as well as more adventurous long distance and off track excursions. The hotel is comfortable and relaxed with superb food. Guided tours return for a late lunch but there are facilities for taking out a packed lunch for those wanting independent all day tours. The guided tours are graded and flexible so that everyone is accommodated from complete beginners to fit experienced skiiers looking for a challenge. The tours are personalised to allow for differing degrees of experience and fitness. The tracks are well maintained and signposted so that it is safe to ski alone if preferred. It is significant that most of the guests, including those who have developed their skills in other centres in Norway (even Kvitavatn! ), now come back to Venabu year after year. This beginner cross-country ski holiday in Venabu was excellent - great skiing, great scenery, great accommodation, absolutely superb food, & the availability of pilates-yoga sessions 3 times in the week really helped with the groaning muscles. Loved the snow-shoe day trip too. Venabu is a wonderful location ,great skiing and food. It was my second holiday there and will definitely go back. Wonderful first experience of cross-country skiing, very warm welcome and excellent food. This is our second visit to Venabu and it completely lived up to the expectations set up on our trip last year. The welcome and service from the owners and staff of the Fjell Hotel was outstanding. The tuition and guiding for x country skiing is really excellent and caters for all abilities and is very ably led by Robert and his team. The pilates classes offered in the afternoon were a bonus and really well taught by Joy. Venabu is a magical place and we intend to return in the future. Thank you for a wonderful holiday. A great experience, excellent guides and attentive hotel staff. Good fun. Great experience for cross country skiers of all abilities, including absolute beginners. Skillful tuition matched to abilities and fitness. Experienced encouraging tutors. Great for people travelling alone, in pairs or groups. Friendly, welcoming obliging hotel staff. More food than you could wave a chef at. I first visited Venabu in 1994 - in the early days of Headwater. I have returned most winters since then - always booking with Headwater. I have never had cause to complain about anything to do with the hotel, destination, or quality of ski guiding. It is the most complete package of perfection from start to finish. Quite simply the best short holiday I have ever had. Wonderful location, great snow, delicious food and excellent company. A real experience of winter in Norway, and an antidote to grey January in the UK. If you enjoy staying somewhere remote, where the welcome is genuine, the food is wholesome and delicious, and the accommodation is comfortable and homely, then Venabu fits the bill. On top of that, there are extensive trails to explore, the scenery is stunning and the skiing tuition and support is excellent. Venabu Fjellhotel is the perfect cross-country ski destination. Headwater really know what they are doing by organising the logistics of this holiday - we highly recommended! Venabu Felljhotel was excellent. What it lacked in glamour was more than made up for by the quality of the food and the excellent staff and ski guides who were so friendly and helpful. The whole experience was wonderful. My first snow holiday and I would definitely go again. Fantastic location to learn cross-country skiing. The hotel, staff, food, skiing instruction and guided tours were excellent. Venabu is a well run and comfortable hotel. The skiing programme was well organised and thought out catering for different levels of experience with a choice of tours offered each day. Excellent holiday for first skiiers. The guides were brilliant and the hotel kept us well fed. The holiday at Venue totally lived up to 'the promise'. The skiing was excellent due to the location and the professional ability of the guides. Great holiday to go on ones' own as everyone is there for the same reason and generally with a similar background in terms of fitness and interests. When not skiing the Fjellhotel provided excellent food, a very welcome sauna and even yoga classes. With everything included in the cost the holiday was extremely good value for money. Would definitely return without question. Venabu is an excellent Cross Country skiing holiday for anybody from beginners to experienced skiers. With a good network of tracks right from the door, plus guides with the knowledge and skills to teach beginners or lead off piste tours. This is backed up by a comfortable hotel with excellent food. Regular vistor to Venabu. Great skiing, good international friends, good guides and good food. What more do you need? Good: - Hotel, food, weather, X-country skiing area, ski team guides and ski prep. organisation. 'Wicked' VIEWS. Very comfortable hotel with a very good, plentiful, and varied daily buffet. The guides were very thoughtful and trips they arranged excellent. My first holiday with headwater - well organised and good service from agents. I travelled alone, and found the whole thing a very easy intro into x-country skiing. While Norweigans of all ages are skiing, my group was definitively middle aged and up. Staff at the hotel were ready to engage & just overall very pleasant. Guides were also easy to get on with altho I would add that while all were very knowledgeable & helpful, some were not so good at actually instructing. If you're a competent downhill skier my advice would be don't go in the beginners group, you'll be bored within 30mins because you already know what skis and poles and balancing feels like. Groups were large, if you want to experience space and peace going off by yourself or with some buddies in the afternoon would do the job. There seemed to be a good choice of equipment, I was able to change my boots after a day or so to get ones which were more comfortable. Also seemed to be in good condition (judging by the boots being clean, newish, not smelly in any way!). location of hotel is excellent for skiing out either in the groups or alone. it's as beautiful as you hope for. And handy to be able to walk down to supermarket. Meals are a buffet - the food was plentiful, delicious, and varied particularly if you eat both meat and fish. I was surprised how good it was, and lots of new things to try - the description given by Headwater of the fermented fish is offputting, but really it's not scary as long you don't stick your nose right into it! Like everyone says booze is pricey, and there's no common area to drink your own with other people (not that's allowed anyway...). I was in a double room in the older wing and it was disappointing: heating which wasn't reliable, thin curtains you could shoot peas through, duvet was short so it would cover feet or shoulders but not both (I'm 5'8'), an open electric bar heater in the bathroom, the shower curtain sticking to your legs scenario, no products except showergel - not even the ubiquitous 'bonnet de douche'. Having said that, I wasn't spending much time in my room but if there were two people it would be a bit of a squeeze finding room for clothes towels etc. Decent quality towels though. There's a separate ladies sauna and if you're prepared to walk over the corridor, up some stairs you can cool down on a tiny deck. Nice. Thank you for taking the time to complete your holiday questionnaire. Please be assured we value all of the feedback we receive, whether complimentary or constructive and use this to help us improve and develop our holidays for the future. Firstly, it was great to see you enjoyed your holiday overall and found the service and organisation good. We were however sorry to read there were areas of your holiday which did not meet with your expectations. We have discussed your comments with our hotelier; she was pleased to hear you enjoyed your stay and would like to provide an update on some improvements they have made. They have installed new heating systems in the East Wing bathrooms. They have also added new soft furnishings to these rooms. They do not provided toiletries, with the exception of body wash, as they have found that most customers prefer to use their own hair products. We have removed our description of the trout dish, which they serve on the buffet. This is a Norwegian delicacy and worth a try. We are sorry if our description was off putting, this was not our aim. In closing, we would like to thank you for choosing to travel with us this winter and look forward to welcoming you on another of our holidays in the future. Excellent centre for xcskiing, both on and off trails. Could ski with guided group or without guide. Very comfortable hotel with friendly atmosphere and staff, and wonderful food. Venabu is an excellent location for a cross-country skiing holiday. The hotel is very comfortable, the food is excellent, and the welcome from the family is warm and genuine. There are ski trails and tracks to suit all abilities, and plenty of guides are available. The equipment is good quality, with metal edged skis which are suitable for tracks and off-piste. We had a wonderful week in Venabu and I'd happily go back tomorrow and do it all over again! We had learnt to ski while living in Sweden 40 years ago and had not been on skis since. We had no idea if we would remember any techniques. On the last day I did a 25km 'safari' and my husband did 17km before lunch, so we felt very pleased with our progress! Great place to experience cross country skiing with excellent instructors who ensured the holiday was enjoyable yet challenging. Fabulous location with memorable food . Another great trip to Venabu, everything up to the usual standard. I particularly like the inclusion of Pilates and Yoga sessions, along with the option of booking a Massage. Good for tired muscles! An excellent holiday for cross country ski beginners. Fabulous location. Great food. Small group. Helpful instructors. This holiday delivers in all respects. This was a brilliant holiday away from the crowds, aggro and danger associated with downhill skiing. I seldom go away alone but the company of like minded people was great. Food excellent, location brilliant - what more can I say. Cross country skiing is hard work - you need to be fit to enjoy it. A great holiday. The skiing was excellent and the quality of the guiding superb. We were really lucky to have great weather. The extra activities available by the hotel (snow shoeing, night skiing, horse drawn sled ride etc.) really added to the experience. The food was plentiful and, as vegetarians, we were well catered for - although the food was a bit richer than I am used to. I really liked the fact that we did lots of off-track skiing. The final day's trip to the hut was a real highlight. The hotel is traditional and some of its rooms are in dire need of an upgrade - that said, the staff are great, it's a good location and the beds were comfortable. read/see clearly for cards/hand crafts, as the lighting in the hotel lounge is very poor and there are 18 hours of darkness at this time of year. The package provided by Headwater was excellent for the solo traveller as it included everything I needed to try xc skiing for the first time. The group approach made it a lovely week; small groups for skiing at different levels each day meant I always had people to ski with. The hotel is friendly and comfortable and ideally situated in the middle of miles of routes. Will definitely be going back! Fantastic service from initial phone conversation with headwater to the holiday itself. the cross country skiing was fantastic, and there were groups to suit every ability. The ski guides were all friendly and encouraging and the hotel accommodation laid back and welcoming. Overall a great experience. Thanks for organising a wonderful holiday. Very good hotel with friendly staff and guides, in a fantastic location. We loved our first experience of cross-country skiing. The ski guides were outstanding, and all staff at the hotel were most friendly and helpful. The food was superb, with a vast array of different dishes at every meal. The skiing area around Venabu is beautiful, with a huge variety of tracks to cater for beginners and intermediates - not being experts, we can't comment on suitability for them. We also loved the snow shoe expedition, and a couple of yoga sessions - both included in the holiday cost. In fact, everything that was needed was included in the price, and it would have been possible to have a good holiday wiothout spending any money locally. All in all, a great holiday. We had a great time. The skiing was excellent and we particularly enjoyed the guided ski tours which took us to different areas every day. We loved the walk on snowshoes to the waterfall too. Thoroughly enjoyable, met a great bunch of people and skied in a magnificent location. There is no better place to cross country ski than Venabu. Food, accommodation and quality of Guiding is excellent and Line, Robert, Wenche and the rest of the team maintain their standards year in year out. A unique place. This holiday delivered exactly what it said on the box- fantastic, extensive, well maintained ski-ing area, a friendly sports hotel, likeminded guests, great hospitality, superb ski instructors and guides. Don't go if you want a modern, five start hotel, but do consider it if you love XC skiing or want to try it for the first time. We would recommend a cross-country ski holiday at this friendly. laid-back resort. The area was lovely and it felt so peaceful because we had it all to ourselves!.The food was bountiful, imaginative and always of high quality. The staff were helpful and leaving the resort felt like leaving friends. The tuition was excellent, the ski tours good and varied. The wireless was reliable. The rooms, though small, were adequate for a week. It was useful to have a drying room for damp clothing and the saunas were good and well-used. The transfers to and from the (Oslo) airport were good and reliable. The guides were fantastic, food amazing. Unfortunately xc skiing is not for us. I decided to take a cross-country skiing holiday at the Venabu Fjellhotel after reading the recommendations left by previous visitors on the Headwater website which I fully endorse. The hotel was comfortable with welcoming, friendly staff. The food was wonderful & plentiful - 5 course lunches & dinners with many different dishes to choose from. The ski tour leaders were excellent.They gave advice on skiing techniques and also explained features of the landscape, plus details of the local flora & fauna which added to the enjoyment of the tours. I stayed in a single room in the East Wing which was adequate if a tad on the small side. Larger rooms are available in the West Wing for a supplement. Tea & coffee was not provided in the room, but is available in the public rooms at no extra charge. I met several guests in the hotel who had stayed there before & one person was on his fifteenth visit! I, also, hope to make a return trip to this hotel at some point as it is an excellent centre for cross-country skiing with many kilometres of waymarked loipen from the hotel. The only improvement I can think of is that it would nice if the hotel had a swimming pool! This beginners week in Venabu was in my opinion the perfect introduction to the delights of cross country skiing . The all inclusive package insulates you from the normal expense of a holiday in Norway in this snow assured area . The hotel was charming all the staff friendly and we wanted for nothing during our stay . The room was warm and comfortable , the food plentiful with all tastes catered for and truly excellent . Our ski instructors,Richard and Siobhan were great . There wasn't a direct flight from Manchester to Oslo but that is the only downside to this holiday ! match this experience and overall value , so I might well be back again ! A really good experience - excellent organisation, beautifully located hotel with comfortable accommodation and lots of really good food, great skiing tuition tailored to our needs, huge choice of ski routes and other options such as snow shoe trekking - and other guests in the hotel were really friendly and good company. Hard to beat! Venabu is the best place for cross country ski-ing. No matter what your level of experience is, you will be well looked after and have a great week. Although the accommodation is dated at this hotel, it is more than adequate, clean and comfortable. The family welcome, ambiance and excellent wholesome food, makes this a holiday worth repeating. The teaching instruction we had was excellent and we were extremely well looked after. The guides went out of their way to ensure we had a rewarding and enjoyable introduction to XC skiing even though we were reluctant to go up or down hills!! This was coming up to our 20th visit to Venabu. For us it is more like 'going home' to see friends and family than a basic holiday. Venabu is a unique destination. The hotel is really welcoming, and the ski guides and the food both excellent. This was my fifth visit. Venabu is the perfect winter 'get-away-from-it-all' destination, and great for immersing yourself in learning how to cross-country ski. It was lovely staying in a hotel that is still owned & managed by the original family. The instructors were superb, and really made the holiday for me. We had an American, Richard , and his lovely wife Siobhan with our beginners group. They were so experienced, yet incredibly patient, enthusiastic and encouraging and displayed such a passion in passing on their expertise. It made for a brilliant holiday! Great introduction to XC skiing. Wonderul scenery, lots of snow. Amazing food! Wonderful holiday in the most amazing,quiet location. Stunning views from the hotel which was run by lovely staff. Will probably go again next year! Cross country skiing guides were great and patient with us novice skiers! Went out on some great trips. A great experience trying something new in a fairly remote location in Norway. Ideal for getting away from city life, we really enjoyed the cross-country skiing and found it reasonably easy to pick up (some downhill ski experience does help). The food at the hotel was excellent, including for vegetarians which I wasn't expecting. The entire Headwater team was extremely professional and accommodating. They were most helpful (especially Donna Webber) in sorting out a more 'tailor made' holiday to suit our particular requirements and we couldn't have been more delighted with the end result. The Venabu Fjellhotell was quite simply one of the best hotels we have stayed in in terms of friendliness, warmth of welcome, quality of food and skiing tuition. We will definitely be going again - thank you to everyone for helping to give us such a wonderful holiday. The Venabu hotel has things just right. The rooms and public areas are comfortable and homely, the food is good and staff are welcoming and helpful. This was our first cross country skiing trip. The equipment and tuition were good and the instructors knowledgeable and friendly doing all they could to ensure everyone has the best experience. A great holiday. Everything it promised and more. The guides, instructors and staff were outstanding. The food and extra activities like yoga mean that this could be a great wellness break in its self, add in the great skiing and beautiful landscape and it has everything you could want. An excellent week with everything just as described on the website. Great service from the whole team at Venabu and a superb choice of food at every meal. Snow-shoeing in fresh snow down to a frozen waterfall was the highlight of my week. Very relaxing. Everything organised for my daughter and I. Hassle free. Excellent holiday. Venabu offers excellent skiing, knowledgeable guiding and fabulous food. Wonderful! Great variety of skiing routes. Great guides - great people. A very unique family run hotel that is very international. Everyone feels at home. Wonderful hotel with very relaxed and friendly atmosphere, and beautiful location on edge of Rondane national park. Ski trails for all abilities. Food and catering outstanding as were hospitality and helpfulness of hotel reception and dining room staff. Excellent sauna and free yoga classes available. Massage also available at additional charge. The provided holiday is inclusive of a full week's guided tours and also 3 very substantial meals a day. If this is more than what some travellers are looking for, the hotel itself provides a range of other flexible options. Journey time from Oslo airport is ca 3 hours by arranged coach but the hotel will also organise collection from the nearest train station for those travelling independently. Other than booking I wasn't aware it was a Headwater holiday. Hence I wouldn't recommend you as I don't know what you're like if you were actually delivering the holiday. Good skiing opportunities in a very scenic location; good equipment with knowledgeable and helpful guides. Family hotel, excellent food, good facilities - sauna, massage, yoga, fitness room, games rooms, horse drawn sleighs, dog sledding, board games, music / dancing. Excellent selection of wines to match some very good food - lots of choice at the buffets. Special Norwegian buffet was very impressive at New Year. All staff we encountered were very friendly and helpful. We met lots of returning clients. Free WifI was a bonus. Good location to offer snow shoeing weeks as well as skiing. Ski instruction was first class, good boots, good skiis, great guides and well equipped ski room. Local supermarket well stocked for any emergencies or forgotten items. Remember to bring a pair of walking boots in order to best enjoy the excellent snowshoeing trip, usually run on Wednesdays! Everything else is catered for on this excellent week for either complete beginners or improvers in cross-country skiing. The Tvete family at the Fjellhotel are not only friendly and welcoming, but also extremely well organised and hard working. The scenery is so stunning that the odd grey day doesn't matter. First holiday on my own, and despite my worries, I was made to feel welcome by the members of my group...experienced warm and friendly company from fellow holiday members, hotel staff and guides.....a busy and active holiday, wonderful scenery, great for me as an important part of the holiday for me is to paint the landscape. Venabu is an ideal resort for cross country skiing. The guides at the hotel are brilliant and make the holiday a memorable experience. We have been to 6 different XC Sking venues with Headwater and Venabu is consistantly the best. Excellent variety and length of ski tracks from easy starts near the hotel to Challenging hills within 5km. Food is always of good choice, well prepared and generous in quantity for hungry skiers. The guides are knowledgable, helpful and good instructors for beginners and more experienced skiers - particularly Robert Molnar, who is a good allround athlete as well as good skier and an excellent instructor. For the above reasons we have now been to Venabu 11 times and we meet friends who also return each year from UK, Netherlands, Sweden, Germany and Canada. Venabu is the perfect place for all generations to enjoy cross country skiing. There is no where better to cross country ski than Venabu. Fantastic scenery, excellent ski tuition, warm & welcoming hotel. Just what I needed to start the new year. Message for hotel- Hotel was comfy but needs to update accommodation. Message for ski instructors - good instruction but need to keep us moving in such cold temperatures so our muscles dont freeze up. Wenche paced things well and kept us moving. Excellent hotel for friendliness and Norwegian culture, especially at Christmas. The food was outstanding. We were complete novices so the cross country skiing was challenging, but the ski guides were helpful, patient and encouraging. A sauna on site was most welcome. The hotel at venabu was excellent. Top notch in all aspects. I was however extremely disappointed that we had to leave at 9am, and duly spend 3 to 4 hours sitting in the airport waiting for the flight home. Considering we travelled through ringebu, then past Lillehammer, within the context of a high cost holiday, not permitting us an hour or so to spend in these places seems very mean spirited. For this reason I would hesitate to recommend headwater. I cannot fault the hotel, so would recommend people to make there own way there . Venabu is an excellent XC ski centre with reliable snow. It has a much better quantity and range of tracks than any of the mid/southern european resorts. With gentle undulating tracks close to the hotel and hills 5 - 7 km away for the more adveturous amongst us. The guides, Robert and Wenche are vey good teachers and guides. The hotel accomodation is comfortable and the food is very good. This is an excellent XC skiing holiday for beginners and experinced skiiers. I have been to Venabu numerous times and , first time visitors are given an equally warm welcome as returning guests. This relates to all the hotel staff. Very nice hotel in an wonderful location. The two ski guides (Robert and Wenche) were excellent and helped to make this a wonderful holiday. I will be going back to Venabu! Venabu was an excellent location, and the facilities and staff there were amazing. Cross-country skiing Managed locally by hotelier. Selected Saturdays from 7th Dec 2019 to 11th Apr 2020, for 7 nights. All dates are subject to availability, please contact us to check. Fully supported programme by resident guides and skis pass, boots, poles and ski hire included. Due to the tailor-made nature of our holidays, we need a little more information in order for us to check availability for Cross-country skiing at Venabu. Simply complete the form below and a member of our sales team will contact you (when it's most convenient for you) to provide availability information, travel options and an accurate price. Of course there's no obligation, but if you do wish to proceed with a booking they will be on-hand to assist you throughout the process.